Welcome to the summer issue of Bear Tracks, our online newsletter. We are pleased to present Bear Tracks, our online newsletter designed to keep you in touch with recent company and industry events. As we celebrate our 30th year in business, we continue to make communications a hallmark of our client service. Feel free to contact us with any questions or to discuss an upcoming project. 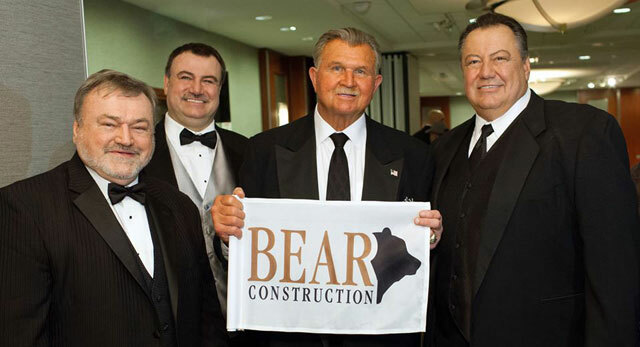 The big news is that Bear Construction is 30 years in business! From a humble beginning in 1984 to employing over 200 full time employees, Bear has been successful in all aspects of commercial construction. 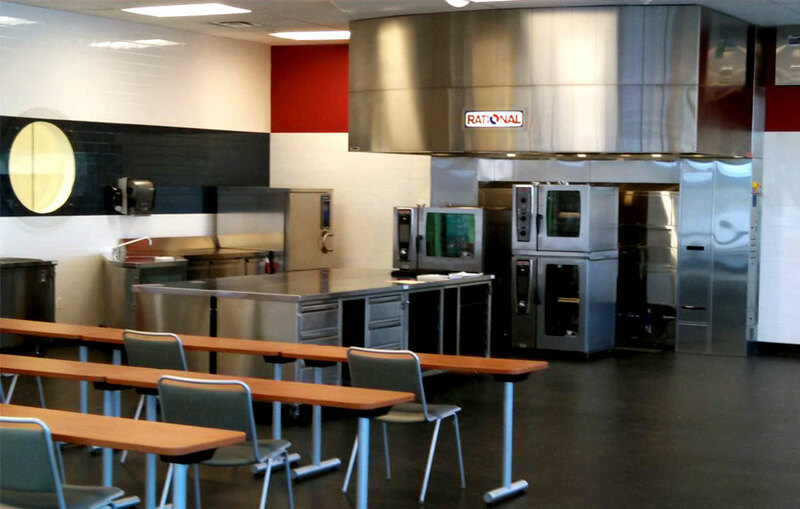 Our service sectors are: Office Interior, Healthcare/Medical, Institutional, Industrial, Showrooms, New Construction, Mission Critical, Pharmaceutical/Manufacturing, Government Contract, Retail and Hospitality. In 2014, Bear achieved two rankings in Crain’s Chicago Business—218th on Chicago’s largest privately held companies and 9th out of the top 20 companies with the greatest increase in revenue (43.2%) from 2012-2013. Most recently, our anniversary was featured in the Illinois Real Estate Journal. We’re proud of our employees and their commitment to keeping our clients happy! 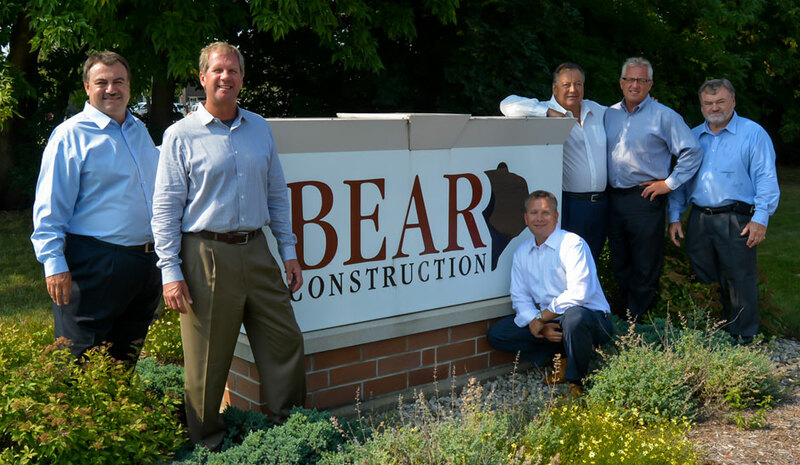 Bear Construction Completed a 14,500 sq. ft. full floor interior build out for hybris software on the 29th floor at 20 N. Wacker in Chicago. Unique design features helped to incorporate the original construction of the landmark Civic Opera Building, built in 1928. hybris software delivers top rated E-commerce software and Omni-channel solutions to help enterprises across the globe innovate faster and sell more. Senior PM Jim Hopkins managed the project for Bear. Perkins + Will were the project architects. 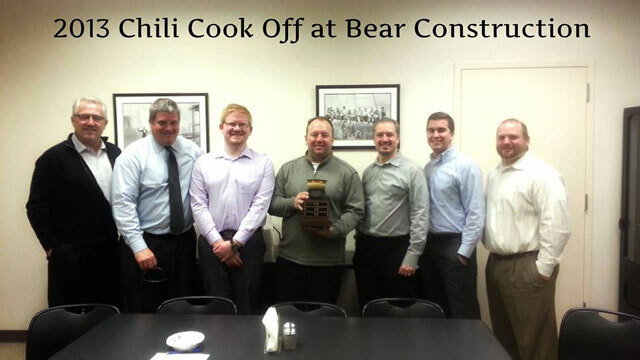 JLL awarded Bear Construction the 5100 sq. ft. American Arbitration project at 150 N. Michigan Ave. in Chicago. The project, designed by Vocon, features many high end finishes. Project Manager Josh Christ brought the project home in 8 weeks. JLL, Telos and Wright Heerema Architects selected Bear Construction for the new fitness center, lounge and rooftop remodel at the 231 S La Salle St. building in Chicago. 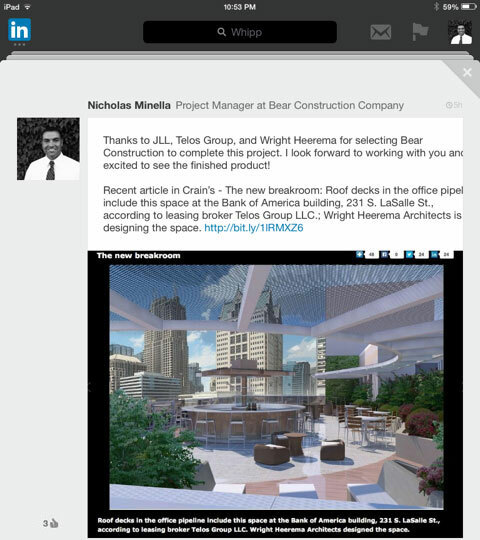 Project Manager Nick Minella will manage the project for Bear. MB Real Estate awarded Bear Construction with the R. J. Daley Center Lobby security upgrade project. Project Executive Tim Klinger will manage the project for Bear. The project was designed by Fujikawa, Johnson and Gobel. Ballistic glass, X-ray and Magnetometer machines make up part of the new security features. Bear Construction Project Executive Tim Klinger will manage the 4 medical office spaces being built out by Swedish Covenant Hospital. 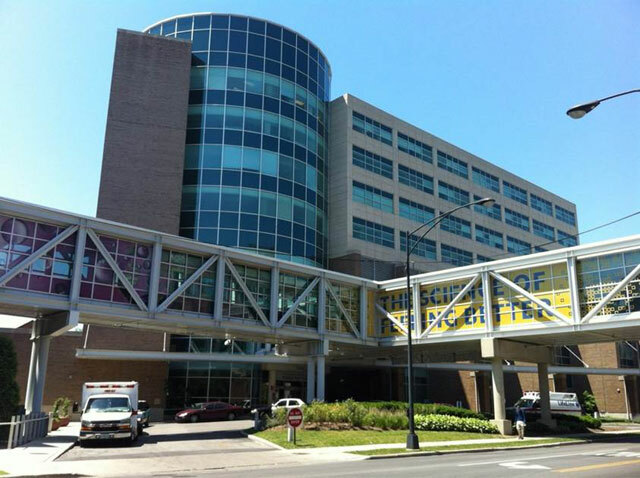 The project includes x-ray and exam rooms and will take approximately 10 weeks to complete. 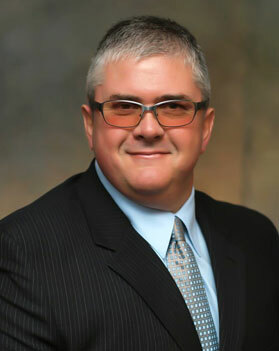 Bear Construction recently hired Joe Nieckula as a Project Executive. Working from the company’s 221 N. La Salle office in Chicago, Joe brings 30 years of experience in the commercial real estate market and will be responsible for budgeting, bidding and growing the interior construction sector for the company. 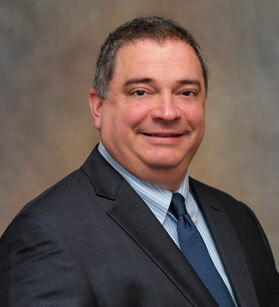 Victor Senese joins Bear Construction as Project Executive at their Rolling Meadows office. 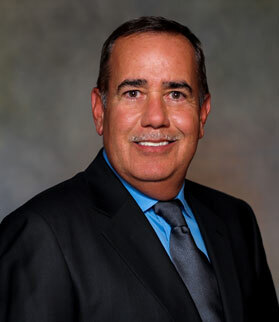 Victor has 31 years of healthcare construction experience and is helping with the continued expansion of Bear’s healthcare and medical client base. 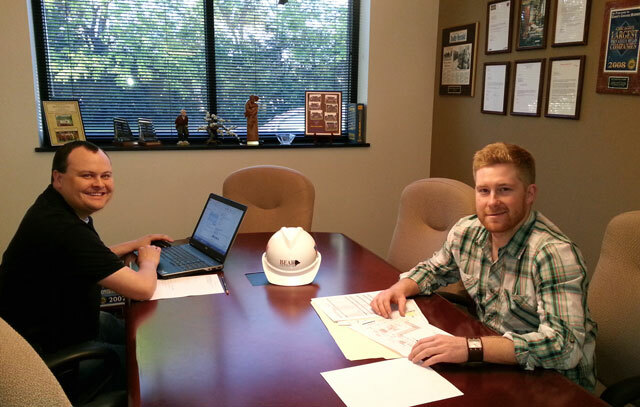 Bear Construction has hired Mike Hill and Nick Wenstrom as Assistant Project Managers. Mike earned an M.B.A. in Business Management from St. Xavier University. Nick earned his B.A. in Construction Management from Northern Michigan University. 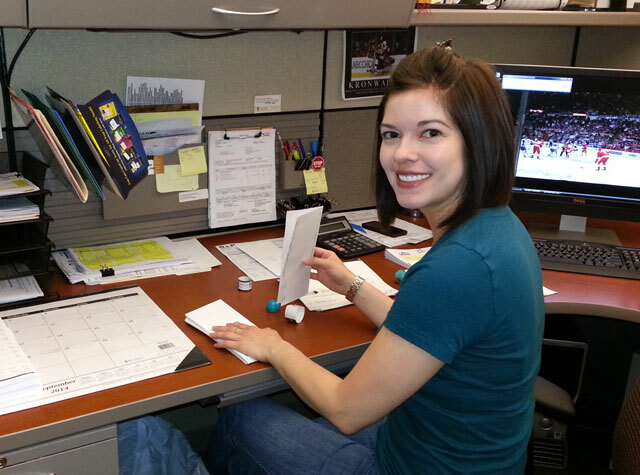 Michelle Trenhaile joined the Bear Construction Team to take over accounts payable for Gerry Sindut who retired on June 30th. Michelle graduated in 2012 with a B.A. in accounting and finance from Aurora University. 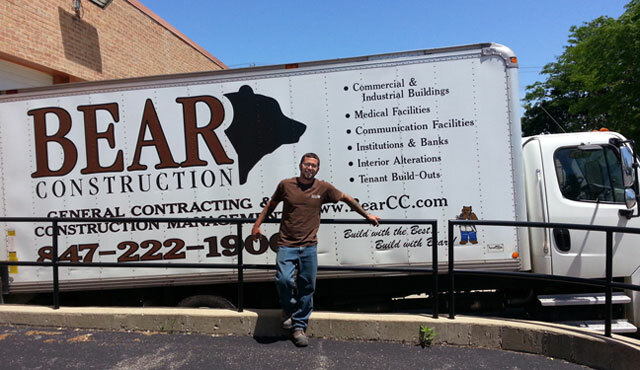 Josh Joiner has been hired as Bear Construction's new truck driver, delivering project materials in and out of the city and suburbs all day.......and sometimes all night. Eddie Mannix, Grant Cooke and Meagan Radloff have been hired as Summer Interns by Bear Construction to support the Project Management and accounting teams. Confidential Client, headquartered in Northbrook, hosted the “Contractors Kick-off Picnic” to benefit the Special Olympics. 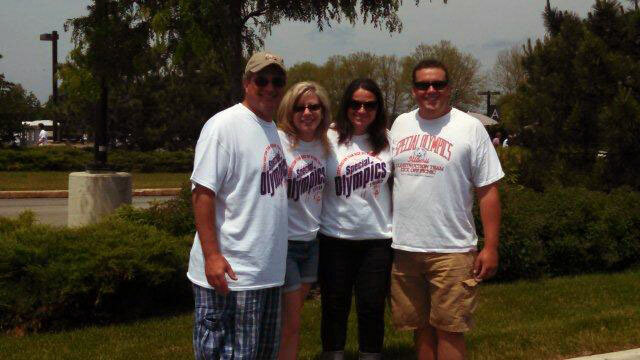 Bear Construction sent a donation along with their VP Mike Colliander and his wife Dawn and Project Manager Ryan McDonough and his wife Ameila, who worked the picnic to make it a great day for the Special Olympic athletes. The donations allow the athletes to participate in various activities throughout the year as well as the Summer Special Olympics! It's not by accident that .68 is our current MOD rating! And for the 30 years we have been in business, our MOD rating average is .81. We are very proud of our safety training program and our Director of Manpower and Safety, John Brennan. 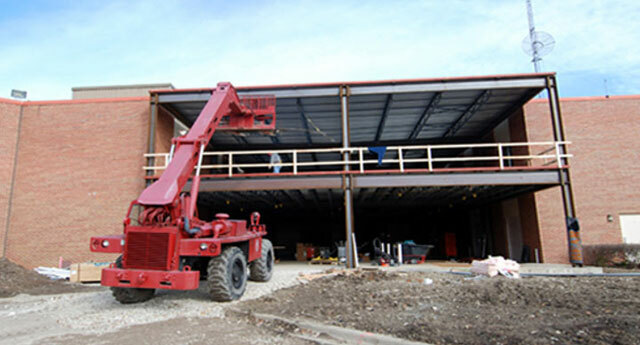 Bear Construction meets or exceeds ALL national and state safety requirements including, first aid, CPR, ACM handling, confined space entry, scaffold and crane use and all other critical areas. And the biggest loser is……………………. 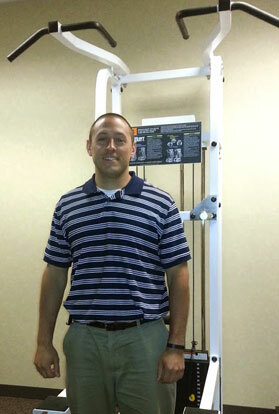 Assistant Project Manager, David Knab lost 45 lbs. over a three month period to claim first place in the Bear “Biggest Loser Contest.” Dave went from 239 to 194, for an 18.83% fat loss. The total weight dropped by the 17 participants was 253 lbs. 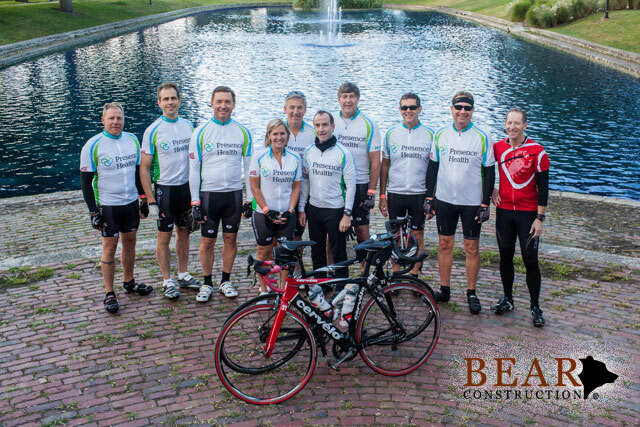 The Presence Health Cycling Team is pedaling again in 2014. 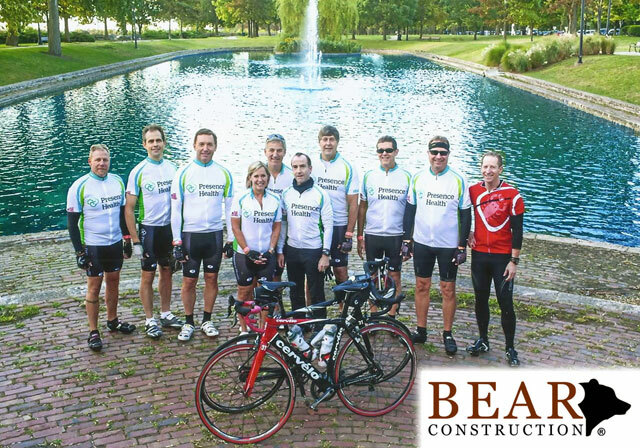 Bear Construction is proud to be a sponsor for the Cycling Team, which promotes health and wellness at organized rides throughout the city and suburbs. Ride on! 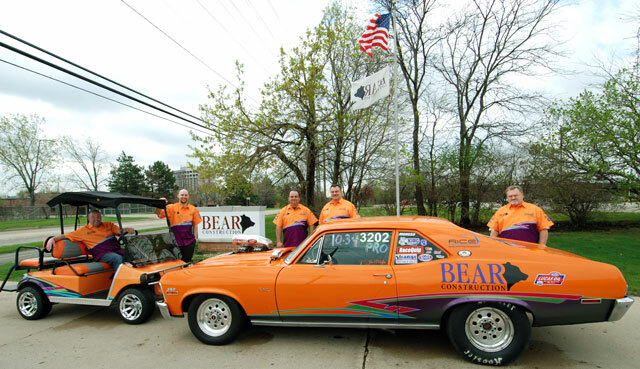 Bear Construction's racing team from left to right: Craig Bergman, Jon Speckman, Joe Malfeo, Jim Wienold and Nick Wienold. Project Executive Joe Malfeo likes to race……cars. His 1972 “muscle car” Chevy has won several national awards including “best appearing car” as voted on by Lucas Oil. It also earned a photo in the Nation Dragster Magazine. US 66 is Joe’s home track and last year he raced in the O’ Reilly Auto Parts Race Nationals against Tony Schumacher, gaining lots of exposure and experience. Buckle up and go, go, go, Joe!